A few poses done before bed, can be highly beneficial. Especially if you know what sort of poses to do, for your own needs. I would suggest that for evening yoga, move slower, and breathe deeply. Which you were doing anyway with the breathing. Weren't you? To make it more R & R, you can use this style of breathing. It is so profound, and will completely relax, and also restore, you. It will make you happy. So, what postures would one do? I was told, years ago, by The Yoga Powers That Be, that backward bends in the evening are too stimulating. For example, doing the bridge pose a couple of times with the breath, eg inhale as you raise your hips, exhale as you lower them to the floor, is in itself, greatly relieving of stress. Particularly if you have had to sit a lot that day. Furthermore, opening up the chest in this pose, encourages deep breathing, and this, in itself, will encourage a better night's sleep. Even holding this pose for 3 -5 breaths will not overstimulate. And if you precede this, with the cat pose, when you exhale and stretch the back, so much tension just melts into the ether. Doing 3 rounds will suffice. We are restoring, remember? So, less will be more. If the correct breathing is done, as suggested in the above link. 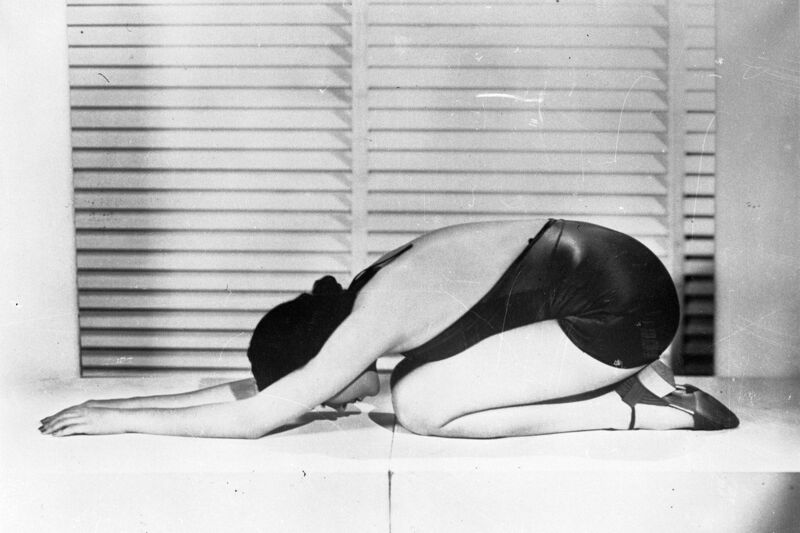 A wide legged forward bend, such as the Star pose, is also deeply calming. Hold for a few breaths. A reclining spinal twist, is perfect. Relax into this pose. the 1/2 shoulderstand, that is perfect. Relax in savasana after. On the floor - or - in bed!!! There are other poses, however, starting with just a few is totally doable. In a restorative, relaxing class, with props, only a few poses are actually used. In a Yin class, and also in some Iyengar classes, props such as pillows and blankets, may also be used. If I even do it at all. For, holding a pose, relaxing with the breath, for R & R, has an adverse, or opposite effect, in these cases. It can bring up anxiety, panic, and overheating. When we are traumatised or deeply stressed, our body is silently screaming at us to take flight (or fight), and in holding a pose whilst we aim to relax, we are doing just the opposite. This just does not work. People need to keep moving and keep their eyes open, in these cases. Please don't impose "yoga relaxation", in any form, on someone in this situation. For it's the opposite of non-violence. It is helpful to know that you can do all of this without props, in classes. A yoga teacher needs to be versatile, and able to teach in many varied ways, Which is not always easy. And it is a skill which comes from teaching. Researching hints and methods helps, too. I am totally surprised. Gobsmacked, even. I was resolute, a year or so ago, about giving up teaching public yoga classes and seminars. I was done, kaput, over it, finished. For many reasons. My teacher, a Maori healer, asked me not to give it up, when he heard of my decision, saying that the yoga part is of whom I am. Obviously, I hadn't given up on the yoga, as you can see. Because I kept going with my blog. Which I love. I love this blog. I have become my own surety. I speak for myself, in yoga, on all levels. And, it was through the training of the Maori healing that this happened. Not the yoga. Although, I am now my own surety with yoga, for sure. Totally ironic, really. I can see the humour in all of this. And my spiritual yoga journey dramatically accelerated when I started my new Path, some years ago. Also ironic. Part of my background, a b-i-g part of it actually, was that I trained yoga teachers. I wrote 4 training courses, and taught them. When I left where I was doing these, at the start of 2007, I sadly had to "let go" of all the wonderful people whom I had taught. Hundreds. But, over the years, various people from those days, have tracked me down. Quite a few. To my delight. I have been truly humbled by this. Friendship really does endure through the various hiccups of life. And, a few months ago, one of these amazing people, Linsey Smith asked me to do a seminar at her yoga studio. We did it together, and I finally felt free to teach properly, away from the dogma propagated by ashrams, books, or groups. Teach the truth, and in this instance, it was about chakras. Of which, I am a totally un-humble authority. But something has changed inside of me. A permanent change. I now want to call the seminar a Wananga. Wananga is a Maori word which means coming together to learn higher, sacred knowledge. Which is what I teach at yoga seminars, yoga sacred knowledge. It is my area of yoga expertise, along with training yoga teachers. I have been going to my teacher's Maori Wananga for about 10 years. I love them. They fulfil me, on so many levels. Through doing this, I have learnt the relevance of bringing spiritual truths into our lives, in a practical, down-to-earth way. Not just in meditation. Not just as The Dogma of Today, in yoga. But as a down to earth, real way. It's a humbling day, as I write this post, for learning how to do all of this has also humbled me. Doing this has become an ongoing daily Wananga, for me. And I want to use Te Reo (Maori language) for my seminars. As a name. I shall probably use both English and Te Reo. When I stepped out again teaching the chakra seminar, it was second nature for us to start and end the day, with a Maori karakia (in yoga we would call it a chant, but it's more than that). "The Call of The Heart": "Te Karanga o te Manawa"
Because I changed, I grew, into someone else. It just happened, and I had wanted so badly to traverse the Maori Path which came my way. Linsey has been learning Te Reo for a few years now, and trains in a very deep path of Maoritanga. So it suits us both, to do this. I have been asked to teach more yoga, in various ways. Not in public classes, but in private sessions, organised by another old friend, whom I also trained as a yoga teacher, many moons ago. I am so happy about this. Lucky me. I admit it. Lying, or seated, for ages (up to five minutes, for example), in a Yin, or restorative, pose, with pillows to ease me into the pose, is not for me. I am mostly a calm and peaceful person, but this would really irritate me. So I don't do it for this long. And, for myself, I would only ever use cushions and blocks if I was working on restoring my health, after illness or an accident. But this is just me, You might enjoy it. Many do. I met a woman not long ago, who did a Yin yoga class, and loved it. When she got home, she felt unwell and very exhausted. I could understand this. When the body is releasing hormones in a pose for too long a period of time, to me that is not good. Most of the poses stimulate our ductless glands, which then release hormones into the blood. Releasing, not creating lots of new ones. When the glands are healthy, they will produce these hormones, and this is one of the miracles of yoga. Hormones are fantastic in that they are integral to keeping our body ticking over, and for keeping us youthful and vital. Is it possible that this above mentioned woman, had too big a hormone rush, and felt depleted afterwards? I am no scientist, just a humble yoga teacher. And I could be wrong with all this. But. Maybe I'm not? It reminds me of when people take the drug ecstasy, (which I have never, ever have done, I don't do drugs) and then get massive rushes of serotonin and dopamine, two of the major happiness neurotransmitters. What happens in this instance, is that our existing supplies of these two, are released en masse from our brain. They are not being created at these times, they are being used up. Then, afterwards, people get very depressed, because their supplies of serotonin and dopamine have been depleted. Not good. And it's not rocket science to figure this all out. Not if you know your yoga. Not if you make time to find out how our body works. I, myself, had first hand experience of this. many years ago. But it was in a different way. When I was undergoing some training, the teacher would have us do lots of surya namaskara (sun salutes), plus poses held for about three minutes each. Stretching, powering up, and extending into the poses. (yes, that was the yoga language of the time..... ) I found it horrible, and stopped going as the whole effect gave me inflammation, and I got tired and stiff. And stressed. And depressed. Holding poses for one minutes would have been fine. Good, even. The thing is, the poses are restorative in themselves. Especially when they are done according to our own capabilities. So if you can do a beginner version of a pose, and hold it for anywhere from three breaths through to one minute, whatever you can actually do, then the pose will be restorative. I was teaching overseas a few years ago, at a yoga studio. One of the teachers had taken a class of Yin yoga, followed by Yang yoga. Yang being harder, more strenuous. A woman was complaining about it, she felt terrible from that class. She had been relaxed, then had to do hard, strong, poses straight after. This was beyond silly. Counterproductive. And also indicative of how untrained many yoga teachers are. The most effective method is: harder, faster, first up, if you want to Yang the yoga, then relax and restore. Try it in your own practice, and you will see. And, a very big lesson that I learnt, in an eat-humble-pie-sort-of-way, is that some people need to keep moving to release stress. Such as runners. Others need a strong hard, workout to release stress. Surfers need to head to the ocean. Relaxing yoga is not for everyone, nor is yoga for everyone. I have a friend who enjoys to stretch into a pose, and feel the after effects. Some people just love gentle yoga, where you're not holding poses too long. But for evening, I do believe that some sort of relaxation is a blessing, and we can combine this with poses, relaxation, and breathing. For ourselves. And, it would also make for a lovely end-of-week Friday evening class.